It’s New Year’s Eve and you don’t have a thing to share for that party tonight? No fear! 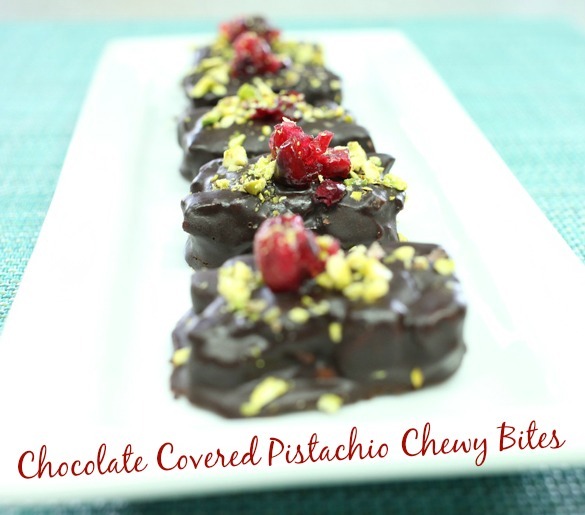 This super yummy and healthy Chocolate Covered Pistachio Chewy Bites recipe from Setton Farms and Spork Foods to the rescue! It’s quick, easy and way delicious! Plus, it’s vegan … but know one will be able to tell! 1. Unwrap all chewy bites and set aside on a plate. 2. Place chocolate chips in a heat-proof bowl. 3. In a small pan, bring almond milk to a boil. Pour over chocolate chips and let sit for about 30 seconds to melt chocolate. Add sea salt. Whisk until smooth. 4. Dip the chewy bites into chocolate mixture using two small forks and transfer them to a baking sheet, lined with wax paper. Top each Pistachio Chewy Bite with a few cranberries and a small sprinkle of the chopped pistachios while still warm. 5. Set aside for about half an hour to firm up on the counter and place in the refrigerator to completely firm up for 2 hours to overnight. Serve right out of the refrigerator.